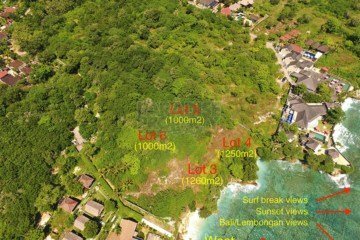 Home » Land » 2000m2 Of Undoubtedly The Best Waterfront Freehold Vacant Land Currently Available For Sale On The Island Of Nusa Lembongan. Very rare opportunity to purchase prime waterfront land on the Jungut Batu Hill, the most popular and tightly held location on the island. Almost nothing left now in the way of waterfront vacant land in this particular area of Lembongan, considered to be the elite and most valuable part per m2. Unrivaled views of the islands only 3 surf breaks, sunsets and the imposing Mt Agung as well as Bali. Coconuts Beach, the paddle out point for Playgrounds surf break, just a 2 minute stroll to the left of this property and the Jungut Batu Beach about the same to the right. Less than a minute away the iconic 5 star Batu Karang Resort featuring the classy Muntigs Restaurant, The Deck and the recently opened Whiskey Bar, plus an abundance of other quality restaurant/bar establishments. Rectangular in shape running up the hill with approximately 30 metres of water frontage and 2000m2 in total size, the property is perfect for a multitude of options such as a hotel, resort or villa development, including restaurant/cocktail bar/day spa or any combination thereof. And a huge bonus with this specific property is the right to build commercial premises on the ocean side of the walkway out over the water, exactly the same as The Deck or Whiskey bar, as well as constructing stairs and a jetty for boat arrivals/departures, adding another unique dimension to an already very impressive development site. The land is offered for sale freehold by its original land owner and is undoubtedly an outstanding real estate investment both short and long term, as Nusa Lembongan continues to surge as a tourist/lifestyle destination. 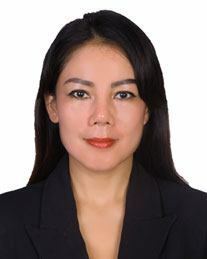 Owner will also offer the property on a 25 year leasehold basis at a price of 8 billion with an option to extend a further 10 years at market value. Water supply: PDAM available, bore can be drilled, well can be dug. Neighbourhood: Jungut Batu Hill, Jungut Batu Village, Panorama Point. Nearest amenities: Jungut Batu Beach, Coconuts Beach, Batu Karang Resort, Multiple Bars and Restaurants.